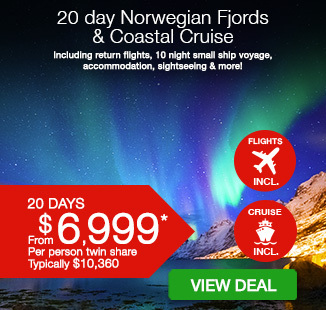 20 day Norwegian Fjords & Coastal Cruise with return flights, 10 night small ship voyage, accommodation, sightseeing & more! 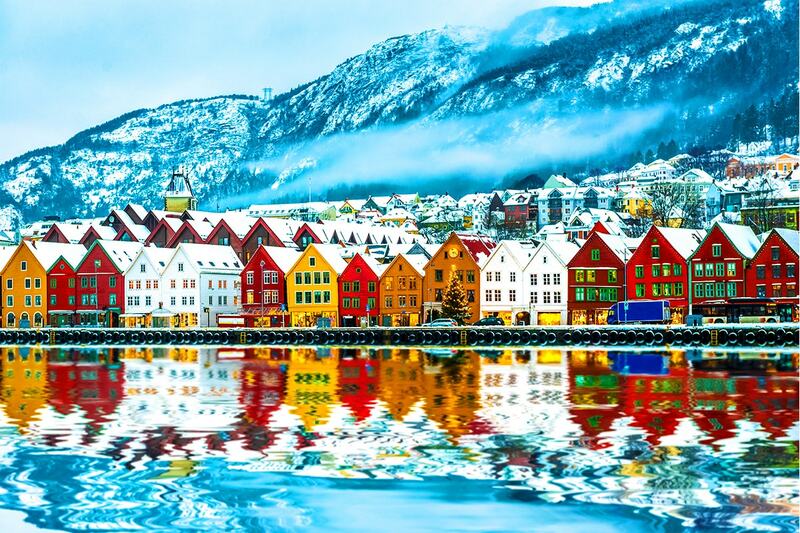 Embark on the trip of a life time and be awe-inspired by the beauty of some of Norway’s best Fjords surrounded by towering mountains as you cruise the Norwegian Coastline crossing the Arctic Circle. 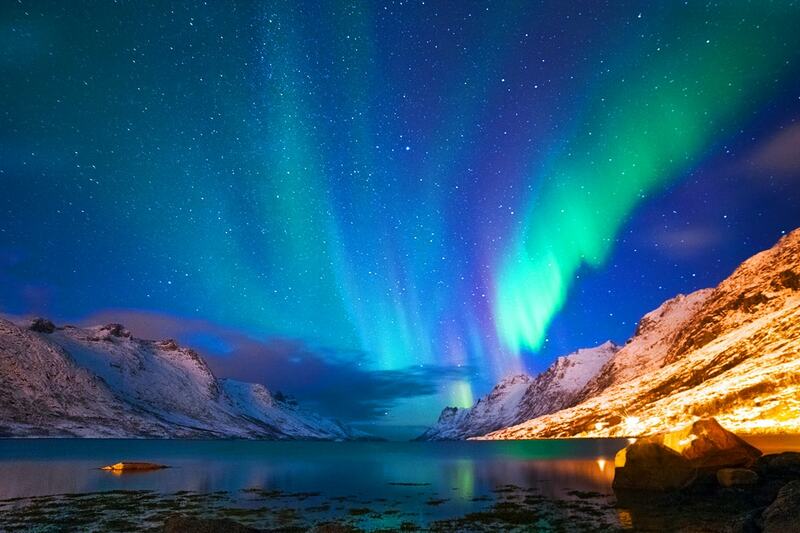 Hunt for the Northern Lights when crossing the Arctic Circle (Winter only). Enjoy the magnificent sub-Arctic landscape as you cross the 71st parallel on your journey towards the North Cape, the northernmost point of the Norwegian continent. Visit the UNESCO town of Roros with its unique traditional wooden buildings. Enjoy exploring the heart of Norway, Oslo and its friendly people! Your package includes return international airfares, accommodation, 10 night small ship cruise, breakfast daily, scenic railway reserved seating and more! Today, departing Australia for your Scandinavian adventure! Arrive to Oslo and make your own way to your centrally located hotel. If arriving to Oslo Gardermoen International airport, we recommend taking the ‘Flytoget Airport Express Train’ directly to your hotel, which is located next to Oslo Central Station and shopping precinct. Today, you will depart Oslo and travel by train to Voss. Voss is located just an hour from Bergen and an excellent base for exploring the fjord region. Step off the platform in Voss and head straight to your hotel. In Voss you are greeted by snowy mountain tops, valleys and forests, rivers, waterfalls and lakes. The town, home to around 14,000 inhabitants, is located in between the famous fjords of Sognefjord and Hardangerfjord, and can offer outdoor adventures year round. It’s not a coincidence why Voss has a world-renowned reputation as Norway’s adventure capital. For nearly 200 years Voss has been welcoming visitors looking for adventures based on nature, local culture and traditions. For the adrenalin seekers, few places in Norway has more to offer. Bungee jumping, skydiving, paragliding, white water rafting – Voss lets you do it all. Catch the train to Bergen. Travelling again on the spectacular Bergen Railway as it carves its way through stunning scenery. On arrival spend the afternoon exploring at your leisure. Mark your way to the port to begin your Norwegian coastal cruise departs Bergen this afternoon. Sail north from Bergen along the Hjeltefjord, the same route the Vikings once sailed to the Shetland Islands and beyond – we are heading to the high north. Spend the rest of the evening relaxing as you take in the spectacular landscapes, either from deck or in the ships panorama lounges. If you wake up early you have the chance to enjoy the breathtaking beauty of the Nordfjord, followed by a delicious breakfast. 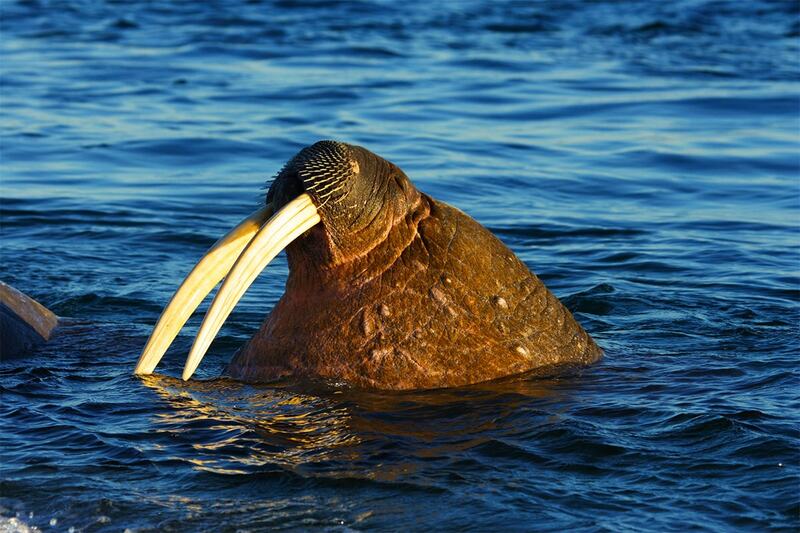 Sail past the West Cape and experience a rare venture into open sea. Then the ship navigates through skerries and islands before reaching Ålesund. We explore Hjørundfjord, situated amidst the majestic Sunnmøre Alps. Its seclusion and unspoiled natural landscape earn this fjord its special character. Today you wake up in beautiful Trondheim. The architecture and surroundings in Trondheim create a beautiful and almost mythical setting for any outing, whether you prefer a guided tour of the Nidaros Cathedral, kayaking on the river Nid and into the city’s smaller channels, or a casual walk or bicycle ride through the Bakkland district. In the afternoon the ship sets a northwesterly course, passing the beautiful Kjeungskjær lighthouse and numerous charming islets and rocky outcrops. After passing through the narrow Stoksund, the ship arrives at charming Rørvik. Today, cross The Arctic circle! The Arctic Circle marks the border of the Arctic region. In summer this means 24-hour daylight – often referred to as the ‘midnight sun.’ During fall and winter, being above this degree of latitude gives you the best chance of experiencing the northern lights, keep your eyes open for this natural phenomenon. The ship continues to Tromsø for a prolonged stay. In winter and spring you can complete your stay in Tromsø with a thrilling husky dog sledge ride. If you want to experience the peace and tranquillity of the sea in summer, why not join us on a kayaking excursion, or participate on a hike on one of the mountains close to the city. The air up here is fresh and clear, and we get a beautiful view of the city and the impressive mountain chains around it. After an exhilarating day in Tromsø, we continue our northbound journey. In winter the Captain invites guests to taste stockfish on deck. The ship is now sailing into the area along the coast where you have the best chance of seeing the Northern Lights between September and March, and we gather on deck to search for this breathtaking phenomenon. Enjoy the magnificent sub-Arctic landscape as we cross the 71st parallel on our journey towards the North Cape, the northernmost point on the continent. After brief early stops in Hammerfest and Havøysund we arrive in Honningsvåg, the gateway to the spectacular North Cape. Close to the North Cape you find one of the world’s most exciting nature reserves, Gjesværstappan. Our ship continues north, sailing in the heartland of the indigenous Sámi people. We pass their ancient sacred site, the rock formation Finnkirka. As we approach our next stop, the fishing village Kjøllefjord, local fishermen ever so often visit us during winter and spring to share their catch of the day (King Crab and Cod) with us out on deck. 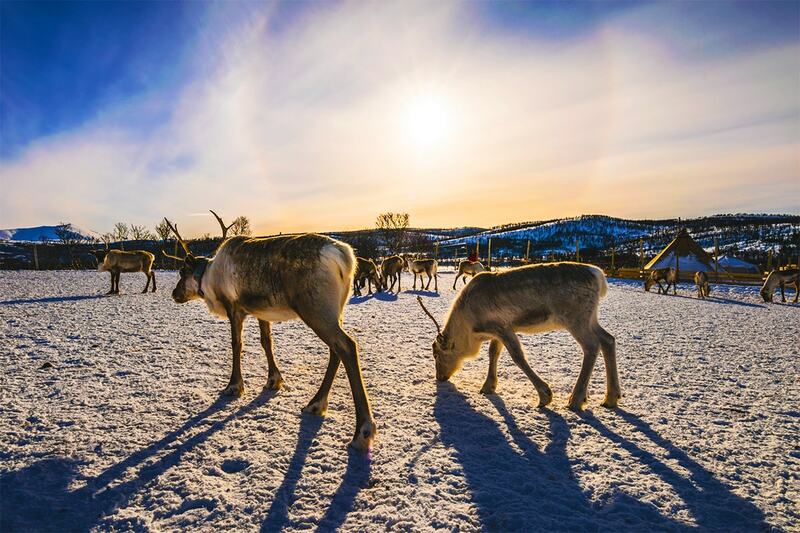 Here you have the opportunity to learn more about the Sámi people, as well as exploring the wonderful scenery all year on our different excursions. In winter you can join us on an unforgettable snowmobile trip to one of Europe’s most extreme and exciting natural areas. Early birds can see Vadsø and just after breakfast we arrive in Kirkenes, putting us at 30° East, further east than Istanbul and St. Petersburg. The Russian border is close by, and you may find it intriguing that the road signs are written in both Norwegian and Russian. Depending on the season, there are several ways to make a visit to the Russian border. As the ship starts its voyage south, you can first enjoy a wonderful lunch followed by views of arctic wilderness from deck or the panorama lounge. There will be a presentation on Pomor trade history in the winter season. The ports previously visited by night on the northbound journey are now seen by day. In the afternoon the ship docks in Vardø again, Norway’s easternmost port. Weather permitting, we may invite you to experience ice bathing in the Arctic Ocean during winter season. We continue along the Varanger peninsula to Båtsfjord before reaching Berlevåg in the evening. 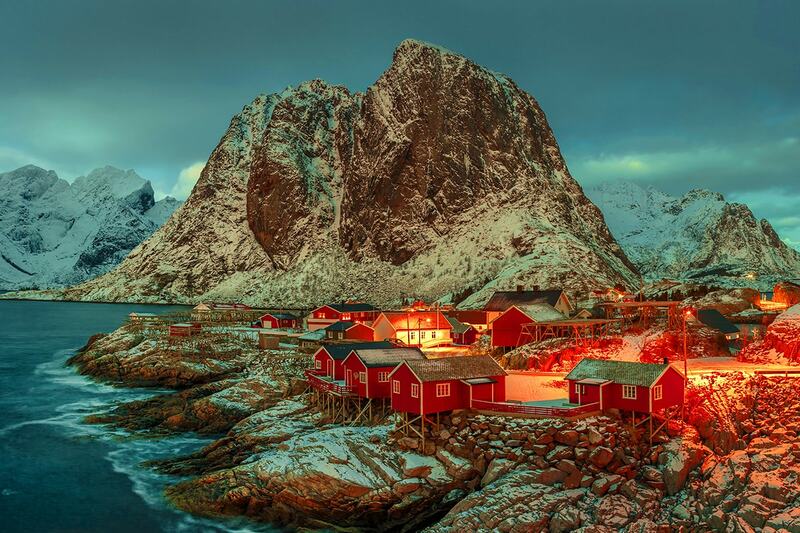 The daylight sailing through the Lofoten Islands is a highlight for many Hurtigruten guests. The Lofoten region is renowned for its natural beauty with steep mountains, wild nature, and small, picturesque fishing villages. This day also offers several exciting optional excursions that will make you feel like a natural-born explorer. In the middle of the night we dock at Mehamn where it is possible to join an unforgettable snowmobile trip through one of Europe’s most extreme and exciting natural areas in winter (on own account). After crossing open water, we will make a brief stop at the old trading post of Skjervøy before sailing through the beautiful Lyngenfjord in spring. Surrounded by the snowy peaks of the Lyngen Alps, we may be visited by a local fisherman and enjoy a taste of local freshly caught prawns. We dock in Tromsø known as “the gateway to the Arctic” just in time to enjoy a midnight concert at the Arctic Cathedral. Alternatively, a walk around town will give you the chance to enjoy a local brew in one of Tromsø’s many friendly pubs. Travel back across the Arctic Circle and through the land of legends. Today you are cruising past the Helgeland coast, with its hundreds of islets, fertile farmland and steep granite walls, is rich in local lore. Legends include how an arrow fired by the Hestmannen troll formed the hole in Torghatten Mountain. Disembark the ship in Trondheim and make your own way to the hotel. Today spend the remainder of the day at your leisure exploring this Northerly city. Today make your way to the train station to take the train to Roros – its unique industrial history has earned it a place on the UNESCO World Heritage List. Røros is one of the oldest towns of wooden buildings in Europe, and is located on a gently sloping plateau 628 metres above sea level. The city was founded in 1644, when the first copper ore was found in the area, and over the years Røros became one of the most important mining towns in Norway. Røros has retained much of its original character. The street pattern and farming properties in the center of town are the same as were originally constructed in the 1600’s. Due to its authentic wooden buildings and unique character of an early mining town, Røros was added to the UNESCO World Heritage List in 1980. On arrival make your way to your hotel where to afternoon is free to explore this incredible town. This morning, make your way back to the station for scenic train ride past soaring mountains and glittering lakes on the way to Oslo. On arrival in Oslo, from the station walk upstairs to your central hotel and enjoy your last night in Oslo. After breakfast, check out of hotel and onwards journey. We recommend taking the ‘Flytoget Airport Express Train’ directly to Gardermoen International airport when departing from here. We hope you have enjoyed your Scandinavian experience! 7 nights centrally located twin share superior accommodation. Package Excludes: Travel insurance, Visas, Anything which is not mentioned in the itinerary. Cruise Shore Excursion: Please note there is a wide range of shore excursions available in the Hurtigruten cruise. This will vary depending on the season you are travelling (Winter, Autumn, Spring, Summer). You will be provided a list of shore excursions on board your vessel. This and booked and paid locally. Note: All flights will be booked with the best promotional airfare. You will not be able to request a an alternative airline. If you wish to fly with an alternative airline, you will be required to take the package as LAND ONLY and arrange your own International Flights to meet the itinerary. By doing so, you must also arrange your own airport transfers. A minimum $500 per person “breakaway” charge will apply per person (plus any fare and tax difference where applicable). Fees are non-negotiable and must be paid before your flight variation can be confirmed. If you are wishing to arrange internal flights within Europe, this must be arranged at your own expense. Webjet Exclusives cannot assist with the purchase of additional flights outside of the itinerary. Your quote will not be provided immediately and will be processed in departure date order only after the final payment has been paid. Please contact flightdesk@webjetexclusives.com.au if you have not received your quote within two weeks of paying the final payment. Please note: Northern Lights are a natural phenomenon (not guaranteed) and best viewable in the winter months between October – April. January, February are the best months for viewing. Adelaide/ Brisbane – A $250 Interstate surcharges applies per person. 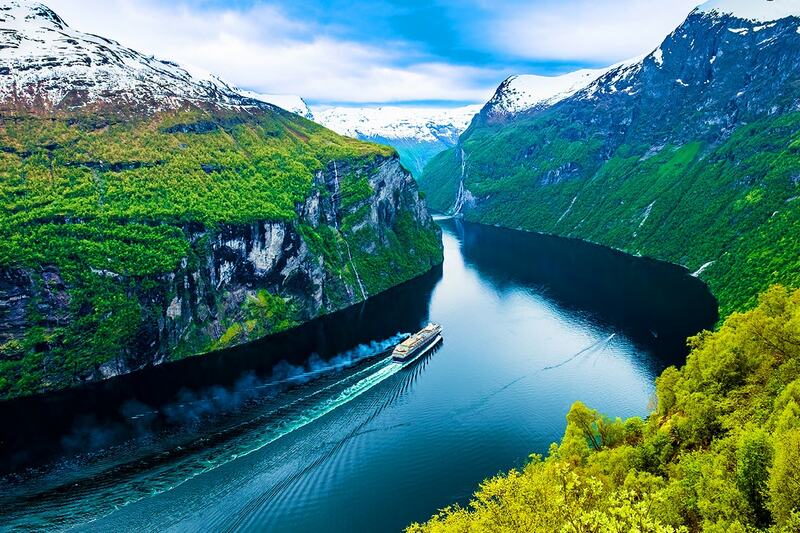 Embark on the trip of a life time and be awe-inspired by the beauty of some of Norway’s best Fjords surrounded by towering mountains as you cruise the Norwegian Coastline crossing the Arctic Circle. 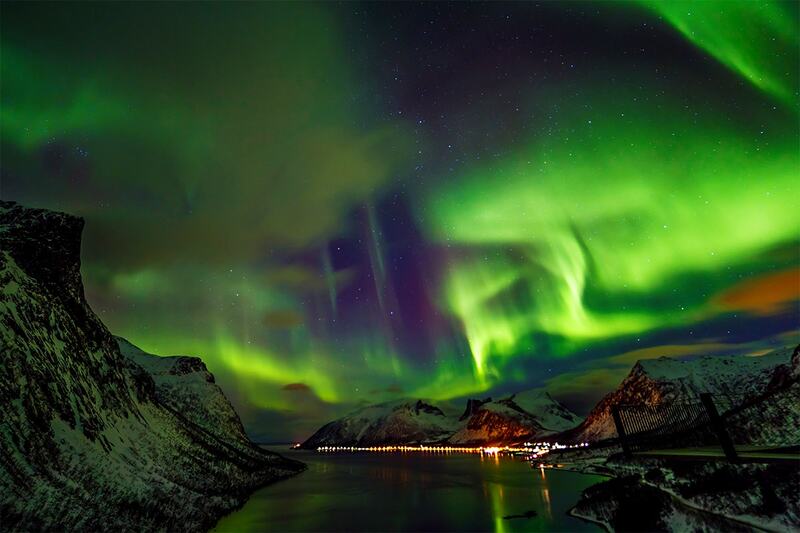 Hunt for the Northern Lights when crossing the Arctic Circle (Winter only). Enjoy the magnificent sub-Arctic landscape as you cross the 71st parallel on your journey towards the North Cape, the northernmost point of the Norwegian continent. Visit the UNESCO town of Roros with its unique traditional wooden buildings. Enjoy exploring the heart of Norway, Oslo and it’s friendly people! Your package includes return international airfares, accommodation, 10 night small ship cruise, breakfast daily, scenic railway reserved seating and more! 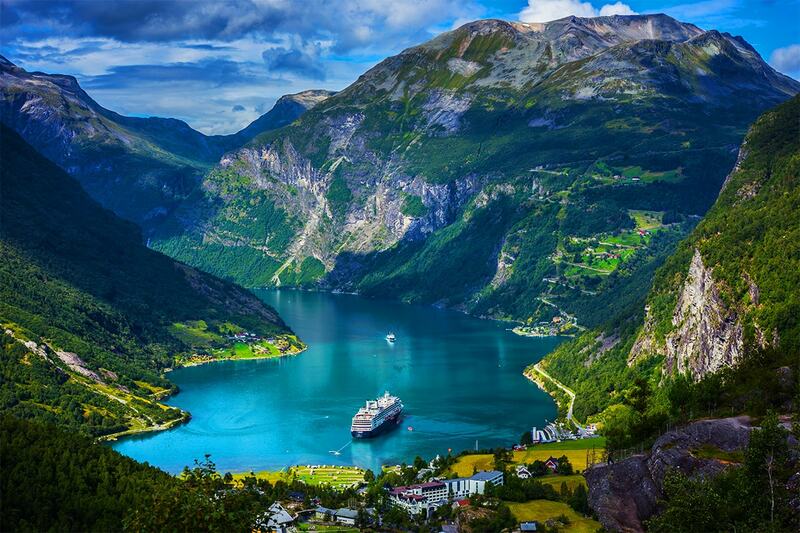 Your 20 Day Norwegian Fjords & Coastal Cruise Package is subject to availability at the time of your booking. We advise you to book early to avoid disappointment.